When it comes to making plans for a wedding there is need for one to actually take really great care when it comes to hiring a Sacramento catering company. Food is one of the most important aspects of the wedding and in the event that the food is either good or bad, this will end up determining how the guests will react to the whole event. Nevertheless, the food needs to be enough regardless of the number of guests as it is a great shame if guests came to witness an event and end up leaving hungry or not satisfied due to there not being enough food or it not tasting delicious and authentic. Listed below are some reasons why one needs to hire a good catering service in Sacramento. One will have an easier time knowing that the food is okay and that the guests have all eaten and gotten to enjoy their day. There is a lot of effort that goes into planning a wedding from decoration to invitations and then there’s the food. However, if you’ve already been able to hire a qualified catering company then there will not be as much stress since you probably already know what you are doing. Nevertheless, a Sacramento catering company that is able to act professional is able to help in regard to saving time since they will have already done the necessary setups, made the food in good time and also have enough food for the guests making it not necessary for people to have to wait for more food to be brought in. The catering service is also supposed to be able to display their food in a way that it will end up wowing one’s guest to the fullest hence the need to always have reliable people to do it. This may come in handy with regard to things like beverages to the food itself as they need to set up in way that is appealing and fits the scene. When the event is well catered, there is normally a lasting impression that is left on the guests. Food is a very essential part of the whole wedding process as it may end up either making or breaking an event. Just by having a catering company on site shows also that one was very prepared to help cater for the needs of their guests. In conclusion, one may easily get a professional catering company in Sacramento that will be able to offer catering services to the best of their ability by simply contacting the Sac Tacos which is Sacramento’s best Taco Catering services and get a rough estimate of the budget. To contact them simply dial 916.529.3285 or visit www.SacTacos.com for more information. 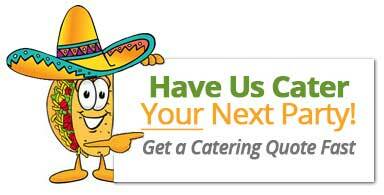 Get a FREE Catering Quote Now! Please be as descriptive as possible about your event and the types of food and amount of guests you will be looking to serve. It will better enable us to provide you with an accurate quote for your event.